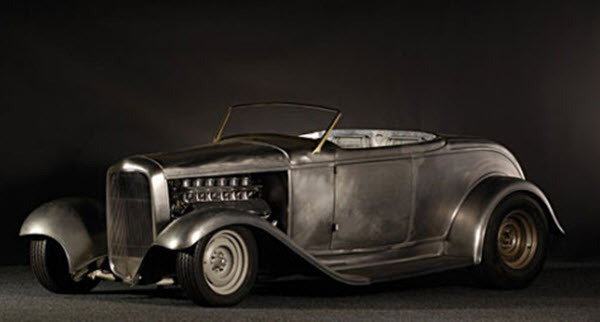 Established in 1991, Alloway’s Hot Rod Shop is creating anything from turn-key hot rods to body and chassis mock-ups, restos, and custom chassis. During the last 25 years, cars from Alloway’s have won numerous awards and garnered a lot of attention within the hot rod community. The merit list includes The Ridler Award, America’s Most Beautiful Roadster, Street Rod of the Year, and Street Machine of the Year, and Bobby Alloway himself has been inducted into the Rod & Custom Hall of Fame. Examples of cars created by Bobby Alloway are George Lange’s 1967 Mustang fastback and Ken Nestor’s 1970 Challenger the She-Devil. Today, Alloway’s Hot Rod Shop is doing the thin rope walk of staying true to their roots, and to the history of the car’s they modify, while at the same time always being in the forefront of hot rod progress. They still make their characteristic rake-all spring and no air cars, with the slammed stance and the huge rear wheels, but quite a lot of things have changed under the hood since the early days of Alloway’s. Today, many customers have developed in interest in “exotic engines” and wish to explore such options rather than automatically going for standard fair small-block and big-blocks. Alloway’s Hot Rod Shop is chiefly a street hot rod builder, creating cars suitable not just for the drag racing track but for everyday use. Many customers are looking for something that will be great for picking up the kids after school rather than something that just sits in the garage most of the year, waiting for an opportunity to race or attend a car meet. Lately, Alloway’s have been working with a lot of first-generation Camaros and C1-C3 Corvettes, as well as Fairlanes from the late 1960s and Mustangs from the early 1970s. As mentioned above, Alloway is not afraid of using any option to give the customers more horsepower, and sometimes that means working with big cars with lot’s of engine space, such as Ranch Wagons from the late 1950’s. Alloway’s Hot Rod Shop is a popular choice for customers that want an exterior that is true to the origin of the car, but with a custom chassis, a more powerful engine, and Alloway’s famous wheels and rake. Successfully combining these wishes is no easy task, but Alloway’s has proven over and over again that they have what it takes to get the look and the performance right.